Big City Cupcakes. 136 Front Street, Penticton, V2A 1H1. Phone: 250-860-5526. Cobs Bread. 112-300 Riverside Drive, Penticton, BC V2A 9C9. Phone: 250-492-8675. Wouda's Bakery. 1846 Main Street, Penticton, BC. Phone: 250-490-3050. Blenz Coffee. 284 Main Street, Penticton, BC V2A 5B2. Phone: 250-770-0306. Fibonacci Roastery & Cafe. 219 Main Street, Penticton, BC V2A 5B1. Phone: 250-770-1913. Jack Kelly The Coffeeman. 1100 Government Street, Penticton, BC V2A 4V1. Phone: 250-492-4635. Starbucks. 202 Main Street, Penticton, BC V2A 5B2. Phone: 250-770-1643. Starbucks. 300 Riverside Drive, Penticton, BC V2A 5E9. Phone: 250-492-6133. Starbucks. 2111 Main Street, Penticton, BC V2A 6V1. Phone: 250-492-9133. Starbucks. 1301 Main Street, Penticton, BC V2A 5E9. Tim Hortons. 234 Main Street, Penticton, BC V2A 5B2. Phone: 250-493-4455. Tim Hortons. 1077 Westminster Avenue, Penticton, BC V2A 1L4. Phone: 250-493-1266. Tim Hortons. 2695 Skaha Lake Road, Penticton, BC V2A 6E8. Phone: 250-493-4477. A&W. 1636 Main Street, Penticton, BC V2A 5G8. Phone: 250-493-3237. A&W. 2111 Main Street, Penticton, BC V2A 6W6. Phone: 250-493-0131. A&W. 116-300 Riverside Drive, Penticton, BC V2A 6W6. Phone: 250-487-9009. Burger King. 1717 Main Street, Penticton, BC V2A 5G9. Phone: 250-493-8411. Subway. 437 Martin Street, Penticton, BC V2A 5L1. Phone: 250-490-3490. Subway. 1636 Main Street, Penticton, BC V2A 5G8. Phone: 250-770-7827. Subway. 437 Martin2111 Main Street, Penticton, BC V2A 6W6. Phone: 250-492-9694. Taco Bell. 1897 Main Street, Penticton, BC V2A 5H2. Phone: 250-492-0003. Wendy's. 1303 Main Street, Penticton, BC V2A 5E9. Phone: 250-492-7466. Boston Pizza. 1900 Main Street, Penticton, BC V2A 5H4. Phone: 250-493-0329. Canadian 2 for 1 Pizza. 111-437 Martin Street, Penticton, BC V2A 5L1. Phone: 250-492-8380. Dominos Pizza. 2050 Main Street, Penticton, BC V2A 5H7. Phone: 250-493-9200. Murrays Pizza & Pasta. 625 Main Street, Penticton, BC V2A5C9. Phone: 250-492-4433. 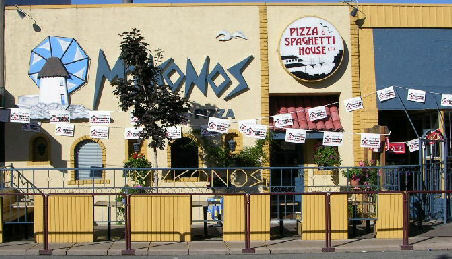 Mykono's Pizza. 329 Main Street, Penticton, BC V2A 5B7. Phone: 250-493-5322. Pizza Hut. 1402 Main Street, Penticton, BC V2A5G5. Phone: 250-310-1010. Barley Mill Pub. 2460 Skaha Lake Road, Penticton, BC V2A 6E9. Phone: 250-493-8000: Fax: 250-493-0052. Copper Mug Pub. 409-1301 Main Street, Penticton, BC V2A 5E9. Phone: 250-493-2842. Cue's Game Room, Grill and Pizzeria. 116 - 2436 Skaha Lake Road, Penticton, BC V2A 6E9. Phone: 250-490-8666. Kettle Valley Station Pub. 1070 Eckhardt Avenue West, Penticton, BC V2A 2C3. Phone: 250-493-3388. Bear's Den Restaurant. 950 Westminster Avenue, Penticton, BC V2A 1L2. Phone: 250-492-0225. Beijing. 504 Main Street, Penticton, BC V2A 5C7. Phone: 250-492-2144. Capital Restaurant. 270 Main Street, Penticton, BC V2A5B2. Phone: 250-492-2923. CK's Oasis. 950 Lakeshore Drive, Penticton, BC V2A 1C1. Phone: 250-492-4092. Chef K's On Main. 314 Main Street, Penticton, BC V2A5C3. Phone: 250-493-2488. China Palace Restaurant. 1933 Main Street, Penticton, BC V2A 5H5. Phone: 250-492-9883. Chinese Laundry Restaurant. 123 Front Street, Penticton, BC V2A 1H3. Phone: 250-492-2828. Cubby Hole. 130 Westminster Avenue, Penticton, BC V2A 1J8. Phone: 250-493-2222. Denny's. 939 Burnaby Avenue, Penticton, BC V2A 1G7. Phone: 250-490-9390. Dragon Garden Buffet Land. 2007 Main Street, Penticton, BC V2A5H6. Phone: 250-492-2088. Earls Restaurant. 1848 Main Street, Penticton, BC V2A 5H3. Phone: 250-493-7455. Elite Restaurant. 340 Main Street, Penticton, BC V2A 5C3. Phone: 250-492-3051. Front Street Bar & Bistro. 102-151 Front Street, Penticton, BC V2A 1H3. Phone: 250-770-1949..
Ginza Japanese Restaurant. 74 Front Street, Penticton, BC V2A1H1. Phone: 250-493-0303. Isshin Japanese Deli. 101-449 Main Street, Penticton, BC V2A 5C4. Phone: 250-770-1141. Joey's Only. 2436 Skaha Lake Road, Penticton, BC V2A 6E8. Phone: 250-770-3115. Kings Garden Restaurant. 101 Westminster Avenue, Penticton, BC V2A 1J7. Phone: 250-492-2121. Lord Chumley's Fish & Chips. 2156 Main Street, Penticton, BC V2A 5H7. Phone: 250-492-4884. Magnum's On the Lake. 21 Lakeshore Drive, Penticton, BC V2A7M5. Phone: 250-493-9772. Navratan Fine Indian Cuisine. 413 Main Street, Penticton, BC V2A 5C4. Phone: 250-490-4746. Pasta Factory. 236 Martin Street, Penticton, BC V2A 5K3. Phone: 250-492-6088. Penticton Pantry Restaurant. 2987 Skaha Lake Road, Penticton, BC V2A 6G3. Phone: 250-492-0496. Ricky's. 2111 Main Street, Penticton, BC V2A 6W6. Phone: 250-490-0375; Fax: 250-490-4748. Salty's Beach House. 1000 Lakeshore Drive, Penticton, BC V2A 1C1. Phone: 250-493-5001. Shades on Main Restaurant. 1909 Main Street, Penticton, BC V2A 5H5. Phone: 250-493-0465. Vallarta Grill. 988 Lakeshore Drive, Penticton, BC V2A 1C1. Phone: 250-492-5610.